Buy any Jura automatic coffee machine from us online and you will enjoy 2 kg of free Cutman & Hawk coffee valued at approximately R 500 delivered at no charge to your door! Spoil yourself and your family with one of these world renowned Swiss made Jura coffee machines and enjoy restaurant quality coffee at home. 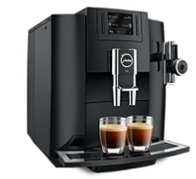 Jura E8: Rent a Jura E8 fully automatic coffee machine for your office or business. This machine is ideal for usage of 10-40 cups per day and you’ll be able to prepare all your favourite brews from espresso to cappuccino and a lot more at the push of a button. In addition to impressing your important clients, your staff are sure to appreciate being able to enjoy good coffee. With our user-friendly rent-to-own system, you can rent the Jura E8 for as little as R 750 (excl.) per month and there’s more - this lovely machine will become yours if you continue the rental for 36 months. For outright purchase, this machine retails at R 15300 plus VAT of R 2295. Jura WE8: This machine can do the volumes! It enjoys the same operating system as the popular E8 above but has a larger water tank; a larger bean hopper as well as larger dreq drawer. This means that it requires less “attention” during busy times. This modern and technically advanced coffee machine is ideal for busy offices, retail show rooms and small restaurants or coffee shops. The WE8 will easily prepare 20-60 cups per day and you’ll be able to prepare all your favourite brews from espresso to cappuccino and a lot more at the push of a button. In addition to impressing your important clients, your staff are sure to appreciate being able to enjoy good coffee. With our user-friendly rent-to-own system, you can rent the Jura WE8 for as little as R 890 (excl. VAT and coffee)) per month and there’s more, this lovely machine will become yours if you continue the rental for 36 months. For outright purchase, this machine retails at R 18300 plus VAT of R 2745. Free with any online Jura machine sale 2 kg of Cutman & Hawk Signature blend coffee beans valued at approximately R R500, shipped to your door at no charge. Jura E6 : This is probably the best home-use coffee machine on the market. Not only is it part of the world renowned, Swiss made Jura range, this model includes the new Jura PEP (Pulse Extraction Process) system. All coffee machines are really not “the same” - The Jura bean-to-cup automatic machines offer professional quality extraction (drawing the flavour from the ground bean). 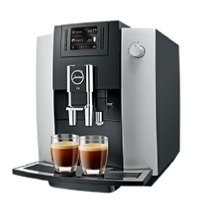 Buy the E6 for your home or office for R 12900 plus VAT) and serve good coffee to your guests at all times. The E6 grinds the beans and offers users six menu items at the push of a button. This machine is ideal for either a private home or a small office, recommended for preparing 0-15 brews per day. For higher volumes and more brew options please see the E8 or WE8 below. This promotion runs from 1 July 2018 to 31st July and is subject to: (1) Availability of stock (2) Orders are placed prior to any price adjustment which might become necessary due to exchange rate (3) (4) All prices quoted on this page EXCLUDE VAT unless stated differently (5) The promotion applies to online purchases only. In addition to the three Jura machines available on this page, we also sell and rent a huge range of coffee machines and accessories. If you are interested in either our coffee or any type of coffee machine, please complete the form alongside and we’ll surely be able to assist. Please send along an enquiry or any questions that you may have using the form below and we’ll get back to you as soon as possible.